I’ve been working on winding coils and testing out a cool new electromagnetic guitar pickup for the upcoming issue of MAKE, so I thought I’d share a modification I did a while ago on the old piezoelectric pickup that was featured on the quick and easy Cigar Box Guitar in MAKE Volume 04. 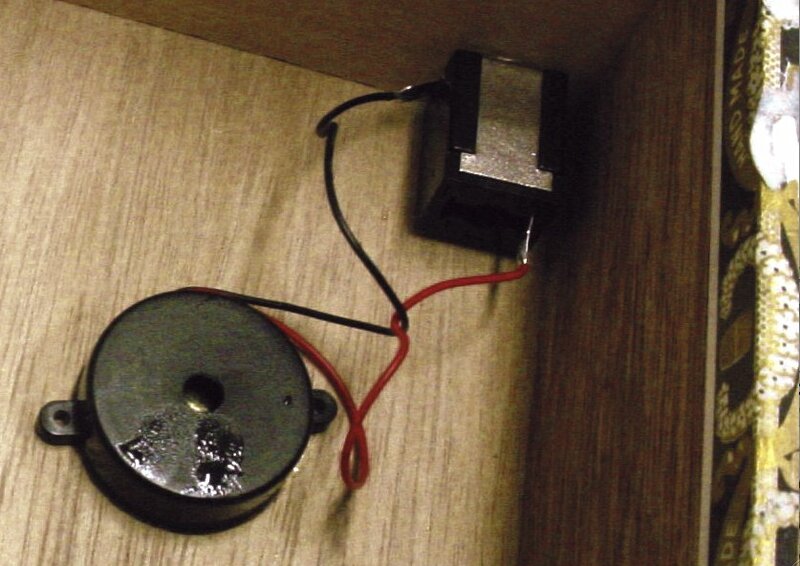 Here’s the piezo buzzer used for a pickup in MAKE’s original Cigar Box Guitar, still encased in black plastic. Piezoelectric transducer discs often come in protective plastic casings, but they’re actually much more sensitive without them! I’ve spent many an hour with needlenose pliers cracking them open like steamed lobsters to get at the ceramic and metal underneath, and I’ve found the difference in amplification to be definitely worth it. The original design had the plastic-encased piezo element (a piezo buzzer) inside the cigar box, and it worked fine, but I’ve learned that it works even better without the plastic case. One of our old CBGs even had the piezo buzzer mounted directly under the strings, sort of propping them up into alignment with the fretboard, in order to show off the pickup. This was failing for two reasons: first, the point of contact was too broad, causing a buzzing sound as the strings hit the long, flat surface of the plastic, and second, because the piezo disc was oriented at the bottom of the plastic casing, it was protected from some of the most important vibrating bodies on the guitar — the strings! I decided to build something where a narrower contact point (or bridge) could directly conduct the vibration from the strings to the disc. Here’s my modified piezo pickup, naked, in direct contact with the bridge, and sounding great. I cut a small block of balsa wood (about the width of the fretboard and long enough for the disc to rest comfortably upon) to prop up the whole setup. I placed placed the piezo on top of this balsa base, then cut a small piece of a wooden barbeque skewer we had lying around and placed that on top of the piezo as a bridge. The strings, once wound on, will normally hold the bridge in place (in fact, many types of acoustic guitars have some sort of free-standing bridge like this), but for extra security, I cut both of the rounded ends off a popsicle stick and glued them flush with the balsa block to provide a sort of “baby gate” for the skewer, to keep it from rolling too much. VoilÃ ! The smaller contact point, applied directly to the piezo disc and held in place by the strings, conveys the string sound wonderfully. What pickup modifications have you discovered?